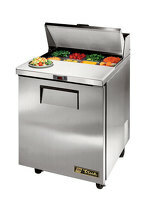 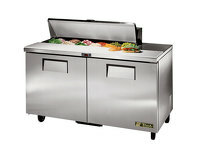 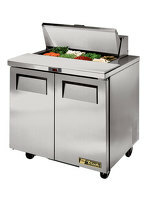 Streamlining the efficiency of your food preparation areas, the TRUE TSSU 27 refrigerated food prep counter offers easy to reach food storage containers, allowing for quick preparation of all your signature sandwiches, starters and salads. 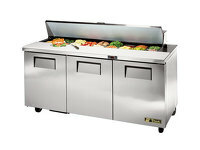 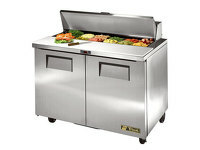 Also know as refrigerated salad units or sandwich units, these refrigerated food preparation units offer the engineering quality expected from True Manufacturing with reliable performance and the longevity. 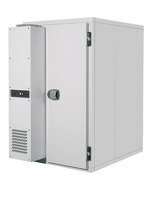 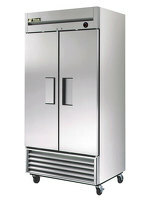 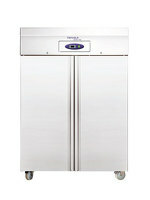 The TRUE refrigeration equipment follow all the standard TRUE practices and its 183 litter capacity occupies just over half a square meter and is just over a meter in height.